Hey friends, what are some of your favorite food memories? Some of my favorite food memories are holiday cookie, confection, and candy making. If you know of my sweet tooth, then you can understand why this was one of my favorite times of year. My Mom always baked breads, scones, biscuits, and cookies all year round, but cookie and candy making was in full force around Christmas and I loved it! 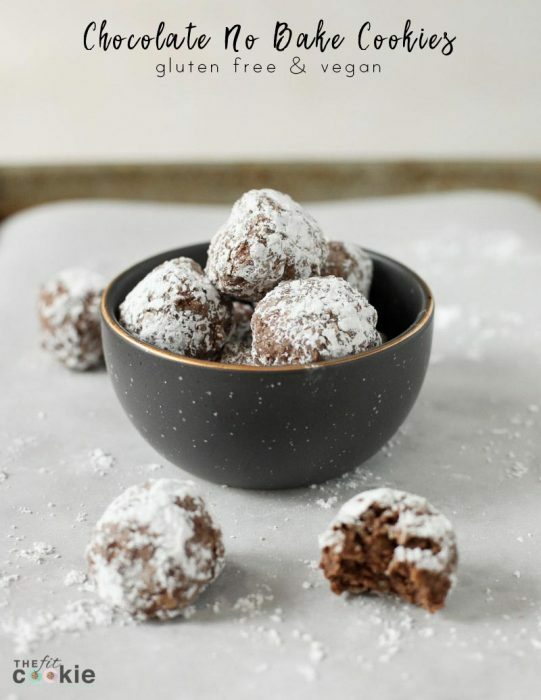 During the holidays we made fun stuff like tiger butter that my dad would mix up, English toffee covered in chocolate and walnuts, buttery shortbread, and our favorite chocolate No Bake Cookies rolled in powdered sugar that we called Eskimo cookies. 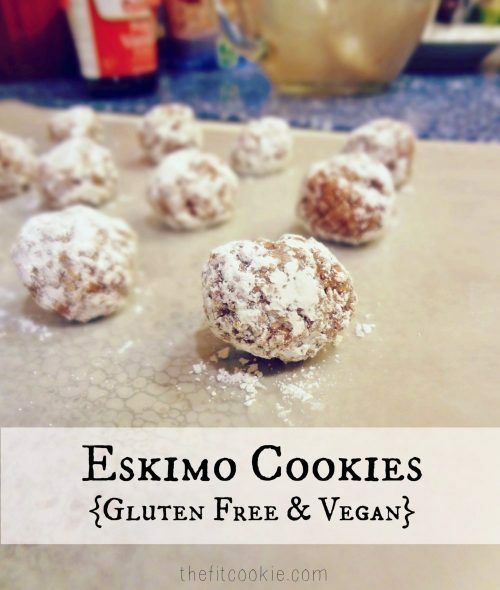 I loved Eskimo Cookies: so easy to make and delicious! There are tons of variations around for no bake cookies, but I adapted the recipe my Mom used to make when I was a kid. 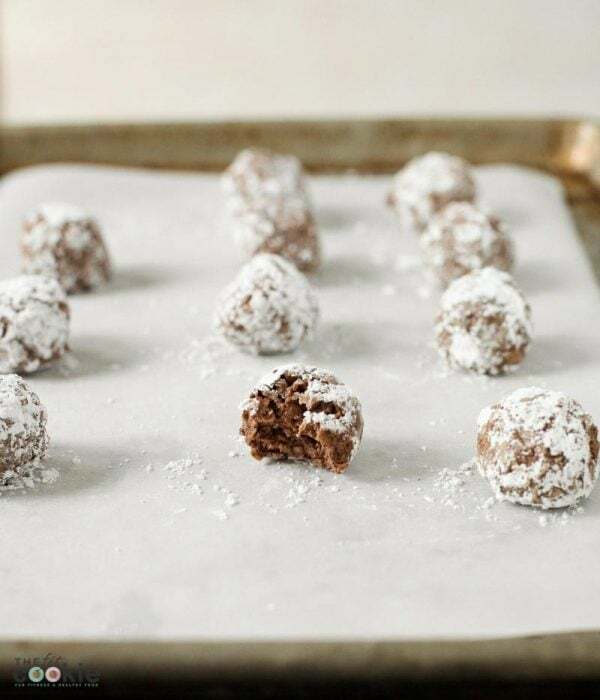 This is the easiest no bake cookie recipe – no stovetop cooking required like some other recipes. I could eat a bowl of this stuff with a spoon (not that I ever did though haha). 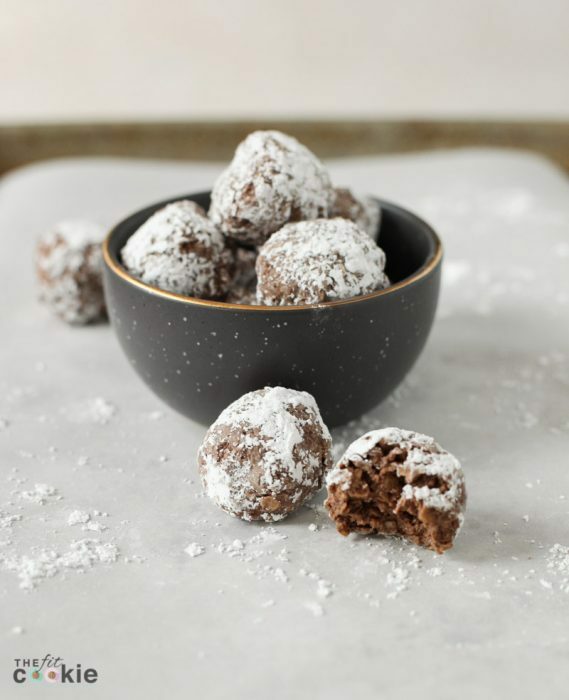 In these Vegan No Bake Cookies, I used Earth Balance Soy-Free Margarine in this recipe for the nice buttery flavor. 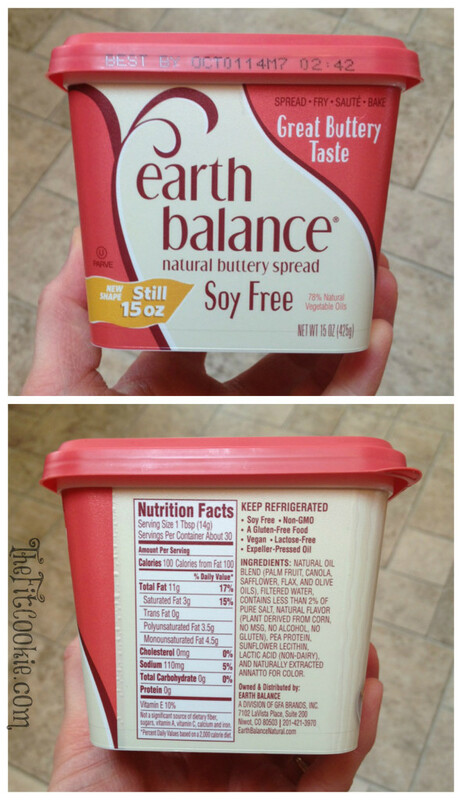 This is great stuff: it’s non-hydrogenated, gluten free, vegan (no dairy! ), and non-GMO. We use it for a lot of our cooking and bread-buttering and it tastes good too. The photo with the ingredients is an older one, so the ingredients may have slightly changed since I took the photo. Someone once got after me on Facebook for using margarine once (cuz healthy people assume all margarine is the devil, right?! ), so I wanted to share the ingredient label and why I used this particular brand to fend off the food nazis. In a medium bowl, cream together the margarine (or coconut oil) and the sugar until well combined and the margarine is softened a bit. Add the vanilla, cocoa powder, and quick oats and mix again. 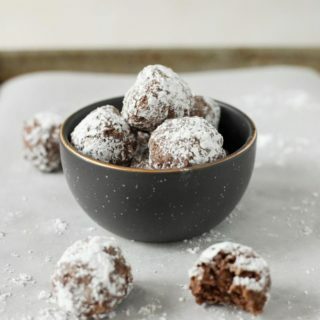 Take a Tablespoon of the cookie mixture and squeeze it together into a ball, then roll in powdered sugar. Refrigerate until set and firm. Store in the fridge. You have another winning recipe! 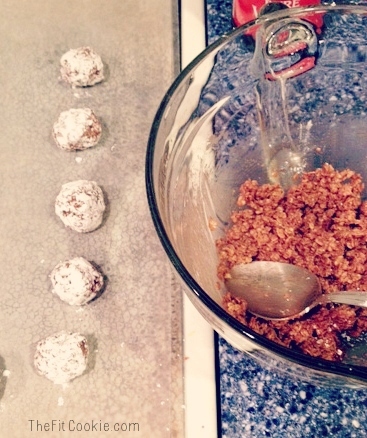 Of course, no bake cookies are my favorite….no heating up the apartment! 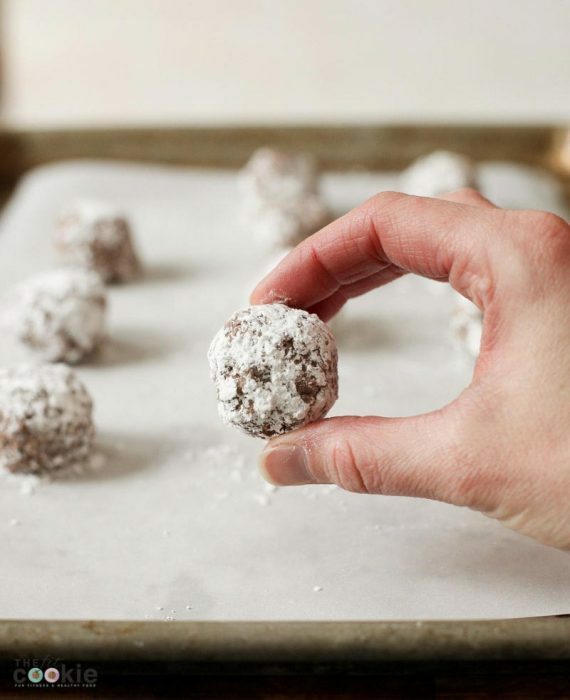 We’ve made these before – but never called them Eskimo cookies or rolled in powdered sugar. Love how recipes change regionally! i need to try these! yum!!! oh yum! What a simple, delicious idea. These would be perfect to add to the baked goods gift we give our neighbors and my kids will love them. These are so cute! The perfect Christmas cookie! And they’re so addicting too!